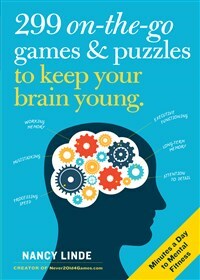 Minutes a day to mental fitness, with all-new, genuinely fun brain games from 399 Games... author Nancy Linde, in an easy-to-take-along size. Nancy Linde created and runs Never2Old4Games.com, an online subscription service for activities professionals working with senior citizens at assisted living residences, retirement communities, senior centers, and other senior-serving organizations. She has produced, written, and directed more than a dozen documentary films, including for the PBS series NOVA. She lives near Boston, Massachusetts.